Heavy duty tarps are a large piece of material which is either made from waterproof or water resistant material or treated with waterproofing after the tarp has been edged and seamed. Tarps have a million uses, anything from protecting a floor from paint drips while decorating to providing protection from the weather for man, beast or material. Most people purchase a tarp readymade with grommets, hemmed sides and reinforced corners for tie down; however, the material itself can be purchased if the individual has something special in mind. The word tarpaulin goes back a long time, it originated from the word palling. Palling is a type of material which can be used as a shelter. When this material found its way onboard sailing ships, the sailors covered it in tar to make it waterproof, the result was the term “tar palling.” Over time this term became tarpaulin. Today, tarred palling is a thing of the past, most heavy duty tarps now are made from synthetic fabrics such as polyethylene. These materials are naturally waterproof as they are synthetic plastic and they are inexpensive to produce. Typically, a tarpaulin is heavy duty by design, it must withstand heavy use, even high winds and flying objects. They are often used by farmers to protect their mown hay which is left in the field and brought in a necessary during the winter; the tarp must withstand the rigors of wind and biting cold. The tarps are always complete with grommets around the edges which make it easy to tie the tarp down to whatever is handy. Many tarps today are produced in colors such as bright orange and blue, this makes them unmistakable when they are used on construction sites, etc. One of the classic uses of a tarp is when an individual goes off into the woods camping. The tarp has a number of uses around a camp site, it can be placed on the ground under the tent to stop damp; it can also be used as a groundcover for those who sleep in the open. Tarps are also ideal as temporary shelters which can be used as a cooking area; they can also be used to process a kill if the purpose of the trip was hunting. 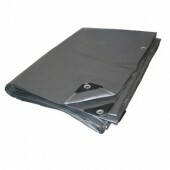 High quality, heavy duty poly tarps will last a long time, all they need is proper care. They should not be left piled up in the corner otherwise they will surly begin to disintegrate.